We hope your Row by Row Experience has been nothing but full of summer fun and travel adventure! 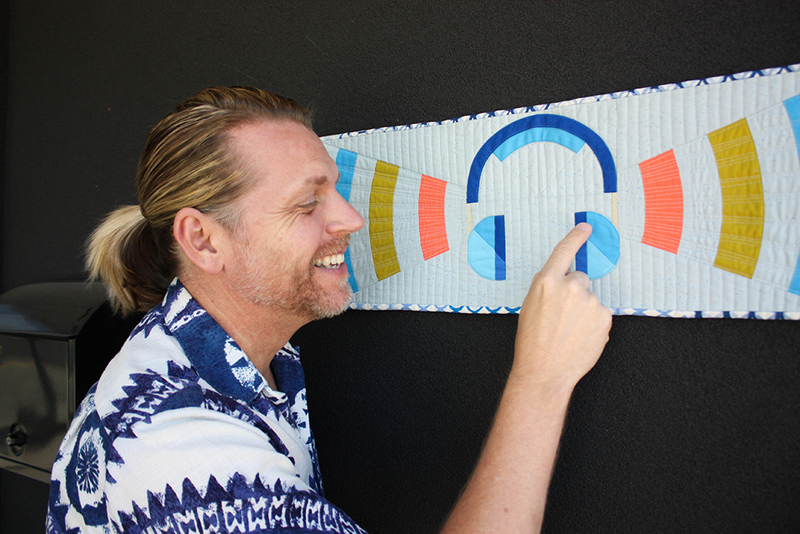 We asked Lane Hunter, our Row by Row pattern designer, to give us some tips and insight on our 2018 Row by Row Experience Summertime Soundwaves block. I’m excited to share our 2018 Row By Row Experience entry, Summertime Soundwaves. Our design was inspired by those beachy Summer tunes that radiate in the sunshine and brighten your whole mood. This pattern uses some fun techniques that are useful to quilters and apparel makers alike. I used this technique to adhere the earphones before edge-stitching them down. I love the look of hand-turned applique but don’t always have the time to do it. 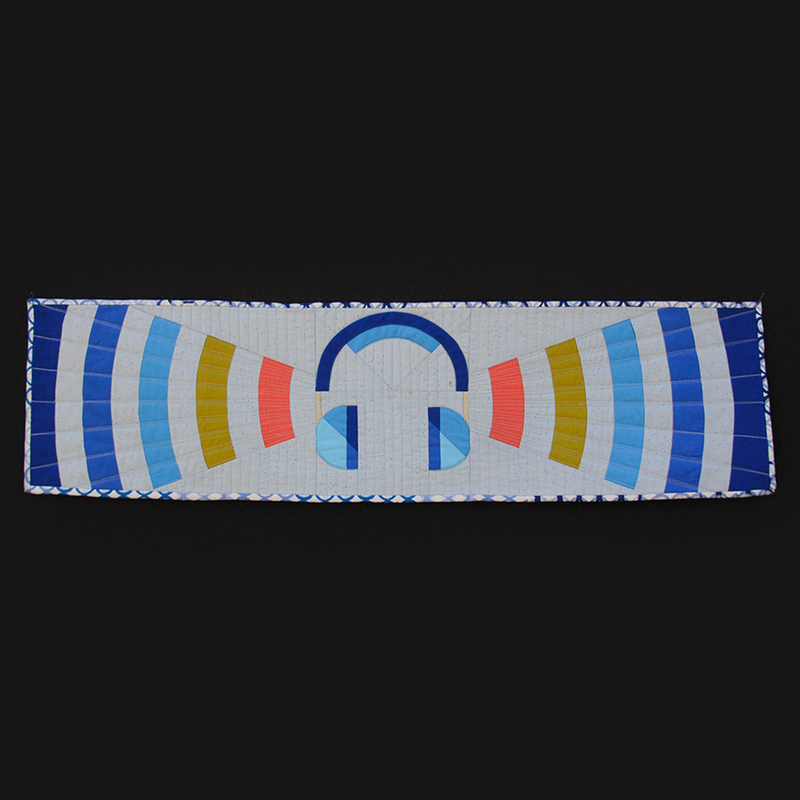 Using fusible interfacing, place glue-side to right side of pieced earphone, stitch the curve, then turn the earphone right-side-out. Use your fingers to press the seams. Do not use a hot iron until you are ready to adhere it to the background piece. This technique is fun for all kinds of shapes and patches on projects. I use freezer paper frequently in my projects when the pattern pieces are vulnerable due to bias edges. In this instance, I traced the soundwave pattern pieces on freezer paper, cut it out and ironed on the right-side of the fabric. Now when I cut out those curves, the freezer paper will hold all of the threads in place until I’m ready to use it. I have also used this technique when creating a uniquely shaped pocket for a blouse or shirt. I know, I know. Quilters have been told to be afraid of curves. I’m here to tell you that these curves are as gentle as a calm sea. And! The farther you get out from the center the easier they get. When sewing curves, one piece will be “convex” and look like the letter D. The other will be “concave” and look like the letter C. I finger-press the half-way and quarter marks on both curves and pin together at these marks. When sewing together, I place the convex (D) curve down with the concave ( C ) on top so I can bend the C curve to match the D curve. The pins make sure I don’t veer too far from proper alignment. Lastly, I need some good tunes to accompany my summer sewing. Thankfully, Modern Domestic has me covered! Listen to our Summer Soundwaves playlist on Spotify. We’ve curated a fun list of songs that bring out the summer sun no matter what Portland’s weather has planned. Did we miss a great summer song on our playlist? Comment with what songs mean Summer to you and we’ll add ‘em! I can’t wait to see your Summertime Soundwaves Row. You can purchase our kit to make one identical to ours, or express yourself with your own colors! Then tag us @moderndomestic on Instagram, #rowbyrowexperience #summertimesoundwaves. Our Summertime Soundwaves pattern is FREE in-store only through September 4. Not local to Portland? You can preorder our pattern or kit online and we’ll ship it to you! All preorders will begin shipping November 1.